Unabridged Audiobook, 13 hrs and 15 mins. Jack Till is a retired LAPD homicide detective turned P.I. Six years ago, he helped a woman named Wendy Harper vanish from the face of the Earth. She’d been horribly beaten and was afraid that next time she wouldn’t survive, and neither would her loved ones. But now, for reasons unknown, someone has framed her former business partner/fiancé for her murder. It’s clearly a trap set for her, but the only way to prove his innocence is to prove that she’s still alive. Even though Till knows the tricks he taught her to disappear, he doesn’t know how she applied his lessons or where she might have gone. It takes some ingenuity, tenacity and luck, but he eventually does. It then takes a lot more of the same to get her back to LA to demonstrate that she habeas her own corpus. Meanwhile, Paul and Sylvie Turner, ballroom dancing aficionados and professional killers, perpetrated the frame and are on Till’s trail as he looks for Wendy (or whatever her name is now). They flirt, bicker and kill their way across California and beyond in their efforts kill Wendy. The narration jumps between the perspectives of Till, Paul and Sylvie for most of the book — with a little bit of Wendy’s and, eventually, the man who hired the Turners. Perry makes some interesting choices about whose perspective we see some events through, giving us Till when you’d expect a Turner (and vice versa). Not only do we see the current action from their perspectives, we get a pretty detailed backstory for Till, the Turners and their boss — interestingly, almost everything we learn about Wendy, we learn from her disclosures to TIll, so we only see her from his point of view. I really got into the story, and found the Turners pretty interesting — ditto for Till. The focus was on the Turners enough that if you told me that Perry’d written a sequel about them, I’d believe it (he did write one about Till). I never managed to get as invested in the backstory (or the current-story) about the man who hired the Turners. There’s some good twists, some smart reveals, and just good action moments. I found the dialogue stiff, awkward and occasionally painful — the interior monologues of the various POV characters could also grate my nerves. I’m honestly not certain if that’s Perry’s issue or Kramer’s. Thankfully, the story was strong enough that I could put up with the problems I had. Kramer’s got a huge list of credits, and is clearly beloved by many. But man . . . I found him tolerable at best, and frequently annoying. There’s a lot of problems that I had with the book that I’m attributing to his narration — I may be wrong about that, but I think if I’d been reading the book, I’d have overlooked and/or not had many of the problems that I did. 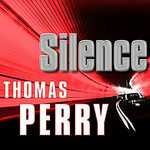 A strong story, with enough tense moments to satisfy any thriller reader, Silence is something to try, but probably only in text-form.